Our facials use traditional methods and techniques, combined with high performance products from organic and natural skincare range Éminence. We understand that your skin can change over time so each facial begins with a thorough skin analysis to allow us to ensure that your needs are always met, so whether you are concerned about pigmentation, acne, ageing or just simply want a luxurious treat, your facial will always be the right one for you. Don't forget if it's your first visit to book a new client consulation with us. Perfect as a quick pick-me-up or a luxury add-on to another treatment. This soothing tonic includes a double cleanse, steam, exfoliation and massage all completed with serums and moisturisers to suit your skins needs and tackles skin concerns. Like our prescription facial products are chosen to suit your skin at the time of your visit. This bespoke facial changes with your individual needs. On each visit your skin is thoroughly assessed and products are carefully selected. Beginning with a deep cleanse and steam, your face and décolleté will be exfoliated, nourished, soothed and hydrated whilst a stimulating head, neck and shoulder massage will soothe away stress, stimulate the production of collagen and plump out fine lines and leave your skin visibly toned and glowing. This is then followed with a masque which is accompanied by a deelpy relaxing scalp massage. Whilst all our skincare is vegetarian friendly, vegan skincare is a little more specifc, so we have created a specially curated facial from our range to ensure complete peace of mind while you receive all the benefits of the prescription facial. Hollywood's favourite facial has arrived at La Belle Jolie! This powerful facial stimulates the micro-circulation, nourishing and stimulating the skin to create a healthy glowing complexion. 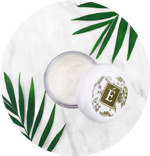 Resufacing the skin, reducing fine lines and wrinkles and a healthly glowing complexing are all acheived with exfoliating AHA's , natural retinol and healing Lotus extracts. With research now showing that particulate matter from pollution is a primary contributor to premature ageing Éminence Organics have launched their very own "anti-pollution solution." The Microgreens detox collection stimulates the release of enzymes that prevent free radical damage and oxidative stress and reduces the signs of premature ageing. this is our favourite facial! Increasing demand in the industry for facial peeling has lead to the creation of this gentle and effective peel. Whilst harsh chemical facial peels can leave the skin impaired and vulnerable until it heals, this gentle non-invasive treatment has no down time and and your skin is left bright and hydrated. Mangosteen helps to protect the skin from dehyration and damage from environmental impact, minimising enlarged pores, stimulating cellular renewal it's even suitable for sensitive skins. You facial is completed with natural retinols which are scientifically proven to outperform their synthetic counterparts!. If you are looking for a facial that offers results and that something extra, our advanced facial combines galvanic current, high frequency combined with massage powerful serums and botanical extracts. Product penetration is enhanced and the skins' balance restored with fine lines and wrinkles visibly diminished. This facial can be used to deal with a variety of skin concerns from ageing, dehydration and open pores to oily skin and acne conditions. The most indulgent treatment of our facial range, this deeply relaxing treat begins with a neck, back and shoulder massage to ensure you are fully relaxed before your facial begins, your skin will be steamed, deep cleansed, exfoliated, nourished and hydrated and further enhanced with a face, neck and décolleté massage using our beautiful range of Éminence organic products. Add that extra special indulgence to your facial and add a neck back and shoulder massage. Please note that certain conditions can prevent you from having a facial. Contagious conditions such as conjunctivitis and cold sores need to be fully healed before you book your appointment.